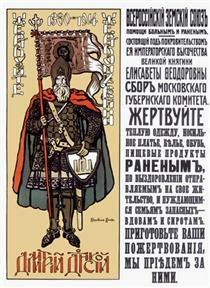 Konstantin was born in Moscow to a merchant family officially registered as "peasants of Vladimir Gubernia". 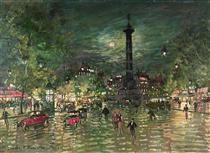 His father, Aleksey Mikhailovich Korovin, earned a university degree and was more interested in arts and music than in the family business established by Konstantin's grandfather. 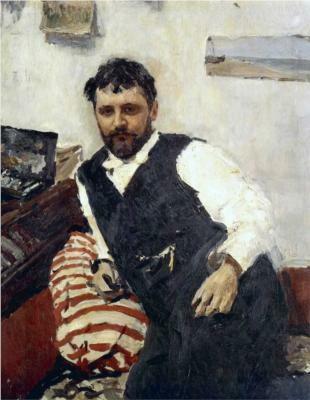 Konstantin's older brother Sergei Korovin was a notable realist painter. 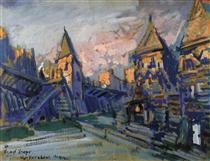 Konstantin's relative Illarion Pryanishnikov was also a prominent painter of the time and a teacher at the Moscow School of Painting, Sculpture and Architecture. 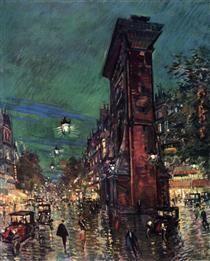 In 1875 Korovin entered the Moscow School of Painting, Sculpture and Architecture, where he studied with Vasily Perov and Alexei Savrasov. 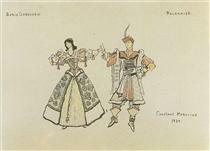 His brother Sergei was already a student at the school. 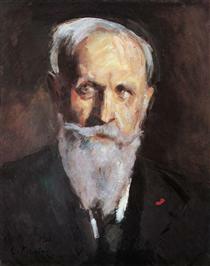 During their student years, the Korovins became friends with fellow students Valentin Serov and Isaac Levitan; Konstantin maintained these friendships throughout his life. 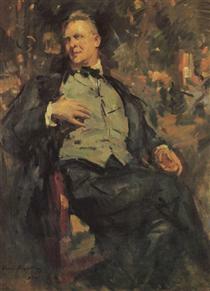 In 1881–1882, Korovin spent a year at the Imperial Academy of Arts in St. Petersburg, but returned disappointed to the Moscow School of Painting, Sculpture and Architecture. 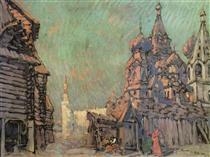 He studied at the school under his new teacher Vasily Polenov until 1886. 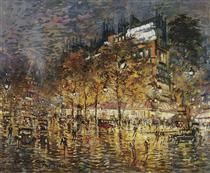 In 1885 Korovin traveled to Paris and Spain. 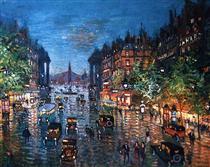 "Paris was a shock for me … Impressionists… in them I found everything I was scolded for back home in Moscow", he later wrote. 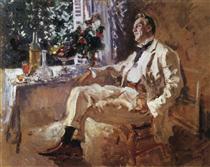 Polenov introduced Korovin to Savva Mamontov's Abramtsevo Circle: Viktor Vasnetsov, Apollinary Vasnetsov, Ilya Repin, Mark Antokolsky and others. 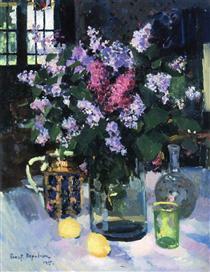 The group's love for stylized Russian themes is reflected in Korovin's picture A Northern Idyll. 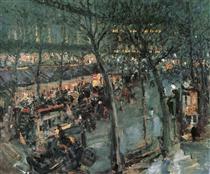 In 1885 Korovin worked for Mamontov's opera house, designing the stage decor for Giuseppe Verdi's Aida, Léo Delibes' Lakmé and Georges Bizet's Carmen. 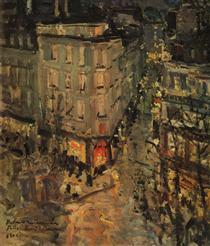 Korovin's subsequent works were strongly influenced by his travels to the north. 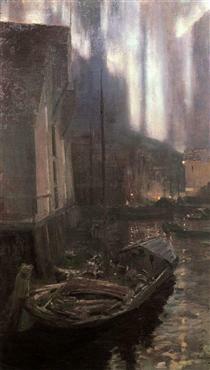 In 1888 he was captivated by the stern northern landscapes seen in The Coast of Norway and the Northern Sea. 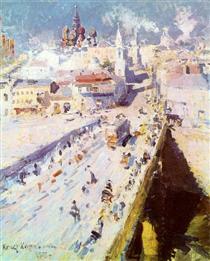 His second trip to the north, with Valentin Serov in 1894, coincided with the construction of the Northern Railway. 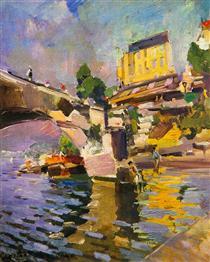 Korovin painted a large number of landscapes: Norwegian Port, St. Triphon's Brook in Pechenga, Hammerfest: Aurora Borealis, The Coast at Murmansk and others. 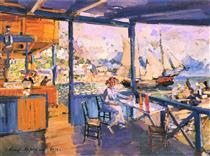 The paintings are built on a delicate web of shades of grey. 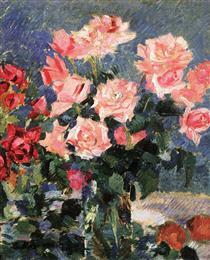 The etude style of these works was typical for Korovin's art of the 1890s.